Elixir Door and Metals Company Series STR 7000 Residential Combination 6-Panel doors are equivalent to typical doors found in site-built homes. Series STR 7000 doors are constructed from our thickest gauge of high quality vinyl laminated galvanized steel. The Series STR 7000 features energy efficient polyurethane insulation, a drive in swivel lock bolt, a dead bolt with a swivel lock bolt, a vinyl sweep, and an optional knocker-viewer. The storm door with a built-in drip cap has three options: conventional, all glass full-view, and full-view. The storm door is 1-1/8" thick with a 1/8" tempered safety glass. The storm door is available in three colors: mill, white, or bronze. 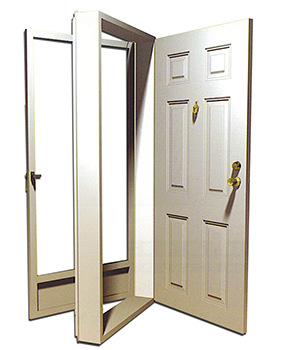 Series STR 7000 doors are available in white or brown and come in eight different sizes. Add beauty to your door with a choice of clear or decorative door lites. Our decorative door lites come with a ten-year warranty. Please contact your local Elixir Division to inquire about Elixir Entrance Doors. 34" x 76" 38" x 76"
34" x 78" 38" x 78"
34" x 80" 38" x 80"
34" x 82" 38" x 82"